Juniper (Juniperus communis L.) belongs to the genus Cupressaceae. In Nova Scotia, the common juniper ranges from a flat-growing shrub to a more upright bush, depending on growing conditions. Completely hardy, it can survive in very poor soil, as well as rich. Poor soil results in a lower, wide spread bush. The volatile oils of juniper berries are most famous for flavoring Gin (named from the French for juniper, "genievre"). It is one of the very few examples of a spice growing in a northern climate. The plant is widely distributed throughout the Northern Hemisphere and grows prolifically in the wild. Juniper has been found being used for medicinal purposes as far back as the second millennium BCE on an Egyptian papyrus. During Roman times, the dried berries were used in place of pepper, which was scarce and expensive. During the Renaissance, they were used in cooking as an aid in digestion. It is thought that this is the reason they are included in Gin, which was first distilled in Holland in the 1600s. 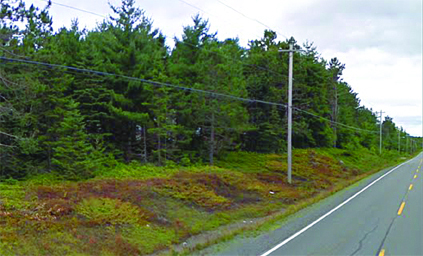 Nova Scotia. Always harvest from an unpolluted area. 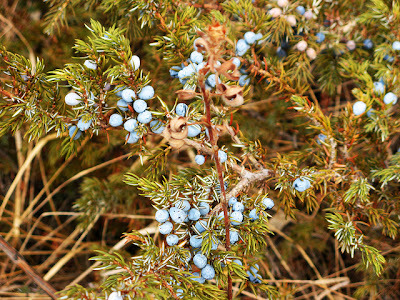 Juniper berries take two or three years to ripen, so blue and green berries are often seen together on the same plant. Only the blue, ripe berries are picked. Once picked, lay them out to dry for a few days. During this time they will lose some of the blue and turn the blackish colour seen when purchased. If harvesting by hand, it may be advisable to wear gloves, as juniper needles are rigid and prickly, which can cause some discomfort. Juniper grows prolifically in Nova Scotia, on mostly difficult soil. It is easy to spot them due to their berries (which are actually modified cones), and multi-stems growing from a single wide mat. Juniper berries have a bitter-sweet taste and aroma which goes particularly well with stronger meats. 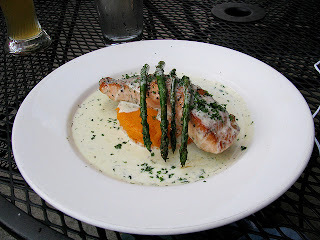 If used judiciously it also complements chicken, pork and even salmon. They are excellent in marinades, stuffings and pâtés and are also particularly good with cabbage, being a traditional ingredient in German Sauerkraut. Medicinally, juniper is used as a diuretic and also as a uterine stimulant during labour to improve contractions. It should be avoided during pregnancy and should not be used when breastfeeding. Do not give to children under 12 years or the elderly, or to people with kidney disease. In sufficient quantity, juniper can also have an adverse affect on glucose levels in the blood, so should be used cautiously by diabetics. Crush the pepper and juniper berries. Combine with the salt and rub onto the surface of the salmon. Add the vermouth to the pan and let reduce by half. Add the cream and allow to reduce to the consistency of a sauce. Pour over the warm salmon and serve. Thank you. I've read that Juniper berries can be used as a 'wild yeast' in brew! The search is on!